This book, the Seven Levels of Communication by Michael J. Maher, arrived in the post. Very excitedly, I opened the package. After a quick glance at its cover with the subtitle “Go from Relationships to Referrals”. My heart sank to the deep dark valley in King’s Canyon. “Relationships to Referrals” those words immediately projected to “manipulation” in my mind. A strong visceral reaction. A multitude of mental and physical discomforts. At that moment, I was strongly in favour of dropping this book right into the recycle bin and acknowledging that I made a bad investment in purchasing it, but would absolutely not sink further cost by spending time on reading it. The images of my Stanford T-group coaches came into my vision. After all, I acquired this book based on their recommendation. I trust them, do I not? Oh, whatever! I could not be bothered to make a decision. Let me shelve this in the corner, so it does not cause me discomfort for now. A month went away. A quarter flew by. About half a year later, I have had this book on the shelf long enough such that I could not mentally deny my ownership of it, despite how uncomfortable I feel about it. This is enough. I either will attempt to read this, or, I will remove it once for ever. As a rational human being (most of the time, I hope), I would not be writing about this book, if it has been a total shame to own it and to have read it. Part of me has not warmed up to it entirely. In my heart and mind, relationships of all kinds are sacred and genuine. They are not initiated nor developed because of the possibilities of getting referrals. They might be a by-product of great relationships, but not an explicit or implicit goal that I feel comfortable to have. This opinion of mine has not shaken by reading the book. However, my initial reaction to this book was totally wrong. This book is about how to effectively communicate, and how to place other people front and centre in our focus. The word “generosity” repeatedly used in the book says it all. It starts from giving rather than from taking. One of the principles of a T-group is to keep what discussed there at that time and that location among that group of people. I would not breach that implicit contract and trust. 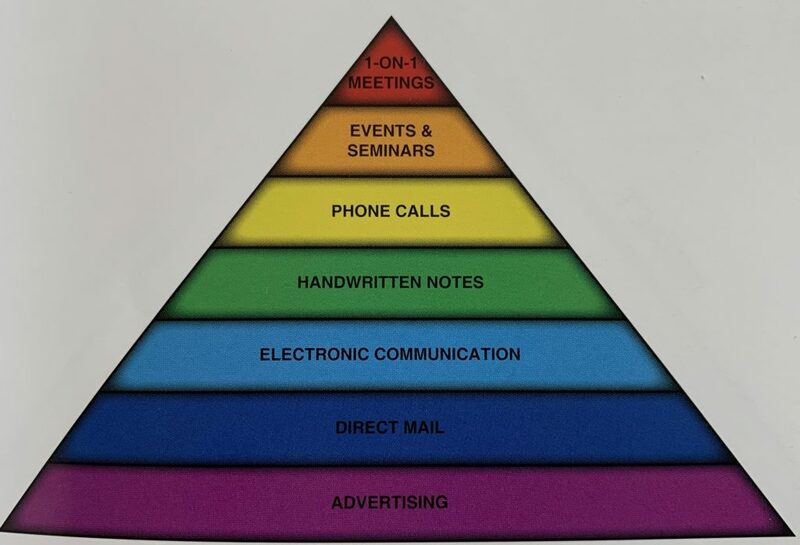 As a completely standalone resource that I share with you here, the communication pyramid gained my attention in the first T-group session. It is cited from this book. We had a great discussion about this pyramid. You now see why I had acquired the book without knowing its subtitle. 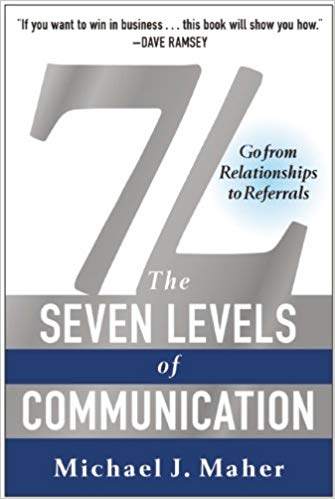 Thanks to that T-group, the pyramid and this book, I have become much more aware of the impact of communication levels and more consciously choosing the right level if there were a choice to be made. There is much effectiveness to be gained by paying attention to the levels on which we communicate with people in both professional and personal settings.